Stiebel Eltron Accelera Series of heat pump water heaters replace your traditional water heater. the world's most efficient Energy Star rated heat pump water heaters! Stiebel Eltron currently offers two versions of their Accelera series heat pump water heater, the Accelera 220 E and the Accelera 300 E. The Accelera 220 E is a 58 gallon heat pump water heater, while the Accelera 300 E is 79.8 gallons. They both offer a digital display, easy access for service with a removable top, a redesigned air flow, and an impressed current anode. 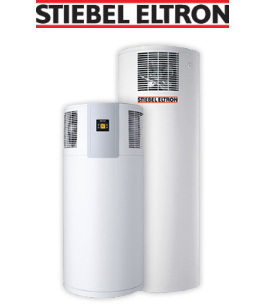 Stiebel Eltron Accelera series are the most efficient heat pump water heaters presently rated by the Energy Star program in North America. Energy Star rates energy efficiency using a measure called the "Energy Factor." The Energy Factor is the ratio of useful energy output from the water heater to the total amount of energy delivered to the water heater and it is measured in accordance with strict standards so consumers can compare the efficiencies of one model to another. The Stiebel Eltron Accelera series boasts an Energy Factor of 3.05. These are significantly higher than most other Energy Star rated heat pump water heaters. In addition, the Accelera series features the lowest operating costs, one of the highest first hour ratings, and one of the longest warranties, making them the best value on the market today. Heat pump water heaters are the latest water heating technology to emerge in the North American market. While heat pumps have been efficiently heating the air in our homes for decades, it is only recently that the same technology has been integrated into relative compact and highly efficient water heating systems for both residential and light commercial applications. The efficiency of a heat pump water heater typically exceeds 200%! Accordingly, they cost less than half as much to operate as a conventional tank-type water heater. A heat pump does not generate heat like a conventional water heater. Rather, it "pumps" or transfers heat from one area to another by alternatively compressing and decompressing a refrigerant as it passes from one area to another. In the case of a heat pump water heater, it transfers heat from the air surrounding the heater into the water inside its tank. Since only a small compressor motor, pump, and fan are required, the process is extremely energy efficient! The Accelera heat pump water heater features a enamel-lined storage tank with a very high level of foam insulation for low stand-by heat loss. A 1.7 KW back-up electric heating element is integrated into the unit to deliver extra heating power in the event that the heat pump is unable to draw sufficient heat from the air surrounding the unit to meet short-term peak water demands. To save energy, the booster heater only heats the top third of the tank (approx. 27 gallons). The tank and heating element are protected from corrosion by an impressed current anode (maintenance-free protection) thereby extending service life. A thermostat automatically switches the booster heater on if the water temperature inside the tank falls below 112F (45C). Like all heat pump water heaters, the warmer the ambient air temperature, the more efficient the Accelera series will be. The Accelera's compressor and fan consume only 1kWh of electricity to generate the heat equivalent of 3 to 5kWh during most conditions. For instance, the coefficient of performance at 70% relative humidity, 59F incoming water temperature, and normal room temperature (~70F) is approximately 4 and will rise to 6 at a room temperature of 95F (see graph below). Accordingly, the Accelera is more efficient in warmer climate zones and perform best where the average year-round temperature exceeds 40F. In a warm climate, the unit can either be placed in the garage or attic where it takes excess heat from the ambient air, or inside the house, where it helps with the air conditioning load. In a cooler climate, the unit is typically placed in the basement where it also acts as a dehumidifier. You get hot water at a discount and a dry basement as well. The heat pump system contains a fan that forces air through an evaporator (1). The evaporator contains a liquid refrigerant. This refrigerant evaporates and absorbs heat from the ambient air. The now warm, gaseous refrigerant is then compressed by the compressor (2) which is driven by an electric motor. As it goes through the compressor, the pressure and temperature rises. The refrigerant turns back into a liquid which is now hot. The refrigerant then passes through the condenser (3), which is wrapped around the water tank, and transfers its heat to the water inside the tank. The now cooler refrigerant then passes through an expansion valve (4), where it transformed back into a gaseous state and the process begins again. The Accelera series and other heat pump water heaters should not be installed in a location where the ambiant air temperature regularly drops below 42F (6C) or exceeds 108F (42C). Since the Accelera takes heat from the air around it, it is most desirable to install it in an area with excess heat such as a garage or attic in warm climate areas. In colder climates, the Accelera can be installed in a basement where it will help dehumidify the air. It is important to ensure that there is a sufficient volume of air around the unit for effective heat extraction and optimal efficiency. There should be approximately 1,000 cubic feet air in the installation room, and not less than 500 cubic feet unless ducting is provided to bring in more air from another room or location and to exhaust the cool air from the outlet of the heat exchanger. In most cases, a room measuring approximately 10 x 10 ft will be sufficient. When installing the water heater inside, the space where it is installed will generally be cooled down during the operation by 2 to 6F (1 to 3C). Please see the Installation manual for important recommendations regarding physical clearance recommendations to each side of the unit and above (roughly 16" right and left, 8" to back wall, and 16" above unit). To prevent nuisance from operating noise, never install the water heater in the vicinity of bedrooms. The compressor motor and fan make about as much noise as a refrigerator or small room air conditioner when running. 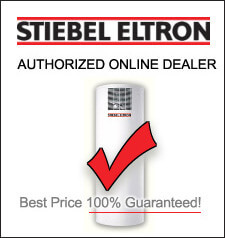 E-Tankless Water Heaters is one of only two dealers directly authorized by Stiebel Eltron to distribute the Accelera series heat pump water heater online. You can be assured that you will not only receive the highest level of pre and post-purchase customer service, including advice with respect to your application, but you will also be backed by a fully valid manufacturer's 10 year warranty if you decide to purchase. Please feel free to contact us toll free at 1-877-374-2696 to speak directly to one of our staff regarding your application. U.S. RESIDENTS: The Accelera series qualifies for an Energy Star tax credit of 10% of the total system cost, including components and installation, up to a maximum of $500. To qualify for the tax credit, the installation must be in an existing home & that home must be your principal residence. New construction and rentals do not qualify. To claim your tax credit, you will need a copy of the Manufacturer's Certification Statement. You can download the PDF here: Accelera Tax Credit Certification. Please Note: Please review our store policies, particularly the return policy as it relates to the Accelera series, before ordering.